Bennett - Voices of the Past, Vol.VI - 'DA' HMV Red Label Cat. 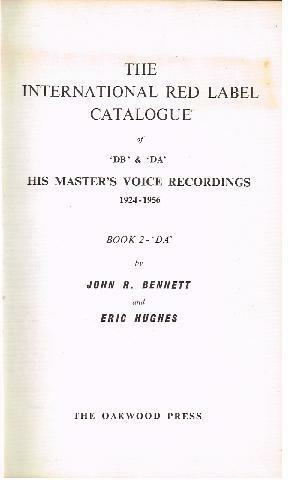 Home > Books > Classical Vocal Books > Bennett - Voices of the Past, Vol.VI - 'DA' HMV Red Label Cat. B1753. Voices of the Past, Vol.VI - The International Red Label Catalogue, (Book II - DA [10”]). Oakwood Press, Lingfield, England, 1957. 233pp. Index. Includes complete listings of the Archive [VA & VB] Series, The American Gramophone Society [AGSA & AGSB] Series, International Celebrity Issues [DJ, DK, DL, DM, DO, DQ, DR, DS], Connoisseurs’ Record Club [Blue Label ABHA & ABHB]. Excellent copy has no DJ; very slightly torn upper spine.